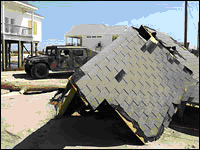 Morning Edition, June 1, 2009 · If any U.S. homes are destroyed during this hurricane season (which runs from June through November), they will probably be rebuilt. That's because it has become routine to rebuild at almost any cost, in even the most vulnerable areas. But history shows that hasn't always been the case, and rebuilding may not be a good idea. Take Dauphin Island. It's off the coast of Alabama, not far from Mobile. About 1,400 people live there. Many thousands more visit the powdery sand beaches during the summer. For decades now, hurricanes have been washing away houses built on the island's west end. There were hurricanes Frederic in 1979, Elena in 1985, Georges in 1998 and Katrina in 2005. 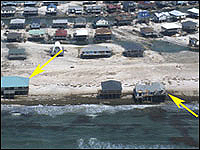 This aerial photo shows Dauphin Island in August 2005 after several hurricanes washed away its coastline. Click to see aerial photos showing the island in 2001, 2004 and 2005. "We lost about 350 homes in Katrina, which was a pretty sizable amount," says Jeff Collier, the mayor of Dauphin and a lifelong resident. But after each hurricane, people on Dauphin have rebuilt their homes. And the government has stepped in to help restore damaged beaches and roads. "The millions of dollars spent has been a good investment, because the island provides recreation for people and a sanctuary for wildlife," Collier says. Also, he says, allowing the island to erode would make other places more vulnerable to hurricanes. "Barrier islands provide a certain level of protection to the mainland." And Collier says it would be unfair for the nation to turn its back on Dauphin Island while continuing to protect other vulnerable areas like Miami Beach, or Cape Hatteras, or New Orleans. "Are we going to let them disappear?" he says. The prospect seems unthinkable today. But that's exactly what people decided to do with an island off the Louisiana coast more than 150 years ago. 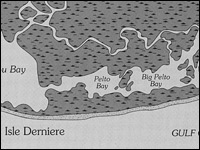 The island was called Isle Derniere. Back in the 1850s, it was a popular summer resort for people from places like New Orleans, says Abby Sallenger, an oceanographer with the U.S. Geological Survey who wrote a book about Isle Derniere called Island in a Storm. "If you had enough money," Sallenger says, "you tended to leave the towns and the cities and plantations and you would go out to the coast and kind of relax in the cooling breezes." Sallenger says Isle Derniere was always a risky place. For one, its highest point was only about 6 feet above the water. Also, it sat on shoreline that had been sinking for thousands of years. And the island is located in an area known as a "highway for hurricanes." Sure enough, in August of 1856 a hurricane did come through, killing about half of the 400 people on Isle Derniere. Sallenger says a young woman named Emma Mille survived by clinging to a piece of debris as she was swept out to sea. "When the storm went by and the wind switched, it actually drove her right back to where she started," he says. Isle Dernier itself wasn't so lucky. The hurricane sliced it in half by forming an inlet between the Gulf and shallow coastal waters. "That cutting of the inlet triggered a process that continued for another 150 years, a process of deterioration," Sallenger says. But instead of trying to repair the island, or rebuild its permanent structures, people simply abandoned it. Sallenger says. That made sense in 1856, Sallenger says. And it might make sense in other places today. If you take a close look at other islands, including Dauphin Island, he says, "you'll see similarities that are eerie." He notes that Dauphin Island's west end isn't much higher than Isle Derniere was 150 years ago. To make things worse, sea levels are rising, and the Gulf is in a period of high hurricane activity. Even Collier, the mayor, says those factors may mean it is no longer possible to preserve the entire island. Recent hurricanes have removed not only homes, Collier says, but the lots on which they were built. "They're actually underwater," he says.